The sports world has a knack for immortalizing athletes who accomplish feats that seem superhuman. Their names are etched in the record books, championship banners hang in their honor and their stories are told for years to come. 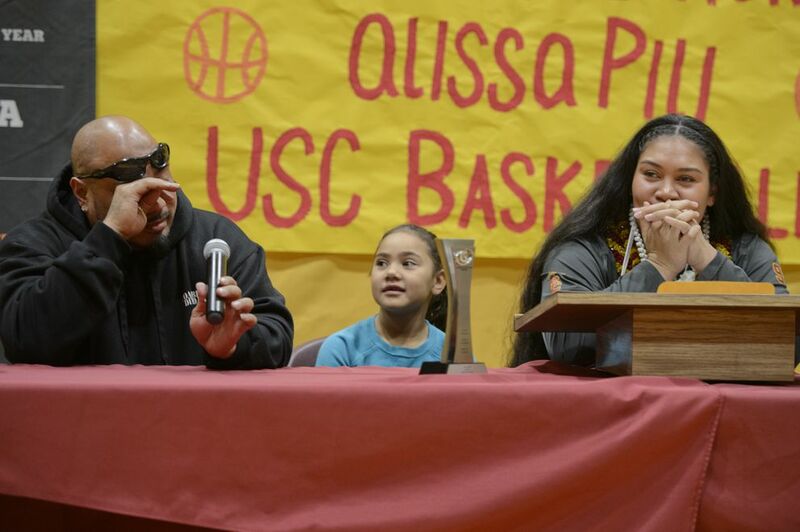 Alissa Pili’s legacy at Dimond High will be no different. The gym is filled with state-championship banners she helped win and the record book is filled with her achievements. In four years, Pili, 17, has won 10 state championships -- one in basketball, four in volleyball, three in shot put, one in discus and one in wrestling. She’ll chase another state basketball title this week at the Class 4A state tournament at the Alaska Airlines Center, where the Dimond girls are the defending champions. A 6-foot forward and an ESPN five-star recruit, Pili has size, skill and dexterity. She owns the Class 4A girls state scoring record with 2,519 career points and counting, she commands double- and triple-teams, she has a sweet outside-shooting stroke and she notches double-doubles in her sleep. Pili, who is headed to the University of Southern California on a basketball scholarship, was the 2017-18 MaxPreps national athlete of the year and just won her third Gatorade Player of the Year award in basketball. Driving her success are the bonds she shares with God, her family and her friends, and a competitiveness sharpened by life in a big, active family. The story of Alissa Pili began in Barrow, a tight-knit community where she was surrounded by immediate and extended family. There was no shortage of time spent with loved ones. But there was a shortage of opportunities. In 2007, Heather and Billy Pili moved their family to Anchorage in hopes of finding better academic and athletic opportunities for their five children (there are nine now). That notion of prioritizing family stuck with Pili, the family’s second-oldest child. She juggles schoolwork and sports with big-sister duties at home. “We’re blessed that (our kids) do that -- give back and help us out,” Billy Pili said. The family is Catholic, and the children were taught to put God and family first. Pili has said she considers her athletic talents a blessing from God. “Growing up in such a big, religious family, we give Him all the glory and praise,” she said. After God and family comes the Pili family’s zest for competition -- and with nine kids and plenty of cousins, there is no shortage of it. There is no shortage of athleticism either. Brandon Pili, the oldest child, is a football player at USC, and Alissa has shown she can do just about anything. Her high school wrestling career consisted of one weekend of competition in her sophomore year, and the result was a state championship. She won the girls heavyweight championship at the conference tournament simply by weighing in -- no one else was entered in the weight division -- and at the state tournament the next weekend she won all four of her matches to take home the title. Pili is shy and soft-spoken off the court, and anything but when competing. Football was her first love, and growing up she competed fiercely with Brandon and other boys. “She played tackle football and she was damn good. I wish she still did because she’d still tear up most of the boys now,” Billy Pili said. She competed with Brandon on the basketball court as well, always trying her best to embarrass him. By middle school, when she started treating basketball as her primary sport, she began to do some damage against her older and bigger brother. “I beat him (one-on-one) way more than he’s beaten me,” she said. At Dimond High, Pili boasts a 3.05 cumulative GPA and is friends with a wide demographic of students. Kathleen Navarre, Pili’s track coach and a longtime math teacher at the school, said Pili is popular because she’s humble, kind and supportive. Navarre said she can’t think of another student who has been more well-liked. Jahnna Hajdukovich, who played high school and club basketball with Pili, remembers a summer trip to Portland when their club stayed with a family that had a piano. Before long, Pili was playing and getting everyone else involved. Pili remembers singing karaoke with her family in Barrow, and she isn’t too shy to belt out a song from time to time. Of course, this wasn’t always the case. She said she used to be terrified to sing in front of a crowd, but she overcame her stage fright when her dad signed her up for karaoke one night at Center Bowl. “Everybody loved her," Billy Pili said. "She sang Alicia Keys -- we make fun of her and call her ‘Alissa Keys.' "
As her high school days near an end, Pili is ready for what comes next at USC, academically as well as athletically.